Friends and relatives in the UK said goodbye to P today. Although I could not be there my thoughts were with them. I posted a picture of P because when people leave us, we keep them alive through photos and stories, and by sharing such photos and stories they are never really gone. So here is a picture of P, not one of him in later years, but one of him in his younger years when I remember him the best. 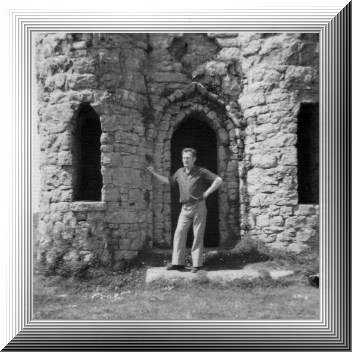 I took this photo of P exploring a castle in Cornwall; we trekked all over Cornwall in those yesteryears, and we never stopped smiling because P always had a funny story or a joke to tell. Consequently, even though it is sad today, I smiled about those good times, and about a great man who warmed our hearts and left us with fond memories.